In February the Abu Dhabi Boundary Affairs Council requested Skilltrade to organize a two week programme in The Netherlands. The 5 Boundary Affairs council students started 3 July with a one week CARIS BASE Editor & Limits and Boundaries Course at the Teledyne CARIS EMEA Office. Every summer Utrecht Summer School offers a broad selection of over 240 academic courses in virtually all disciplines. 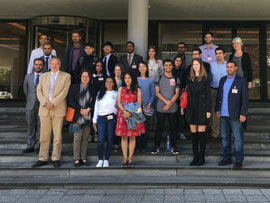 One of the courses was the one week course: Introduction to the International Law of the Sea. The 5 students of the Boundary Affairs council attended this interesting course. In cooperation with the Royal Netherlands Navy Hydrographic Department we organised the final day of the Summer School course at the Royal Netherlands Navy office in The Hague. This day was attended by more than 30 students excluding the staff of the university. In the morning all students presented a relevant subject and in the afternoon the Hydrographic Department and Skilltrade provided more background information how the data is collected, the function of a hydrographic department and the role of education.